LOS ANGELES, Calif. /California Newswire/ — Author-filmmaker-musician John Scott G is creating the world's first omnibus novel. Interweaving nine novels, dozens of short stories, numerous comedy routines, and a great deal of political satire, "Area Code 666" is being serialized on Ga-Ga.com, the new online magazine of the arts (in BETA). Comprised of books, short stories, comedy routines, and political satire, the "omni-novel" from John Scott G explores themes of religion, Satanism, erotica, and politics. The unusually-named G is happy to tell people that a lot of the incidents in the omni-novel come straight from a higher or lower source. "Lucifer is the main narrator of 'Area Code 666,'" G says satirically, "and at heart it is the devil's search for God. There will be an apocalyptic reunion scene, I promise." As the book's promotional tagline states, "Lucifer narrates a twisted tale of subordinate devils who come to earth to observe, infiltrate, tempt, meddle, and wreak havoc." Many chapters are reports from Satan's entities as they infiltrate every aspect of society from boardrooms to bedrooms, from church pulpits to political rallies, and from cozy homes to clandestine cult meetings. One of the books deals with the birth of computer fraud. Another is a tale of a scientist who discovers a truth serum and sets out to place it in the water supply of the country. Yet another story is of a serial killer with second sight who begins helping the cops solve other crimes. "With this gargantuan project, I am exploring the modern world in the best medium ever invented: books," G states. "Albeit books in pixel form." There are 666 chapters planned for the book and 192 of them are live and available online as of Feb. 1, 2016. "Six chapters appear each month on Ga-Ga, which is not to be confused with Lady Gaga," G notes. Artwork, music tracks, and music videos from FookMovie accompany many of the chapters. 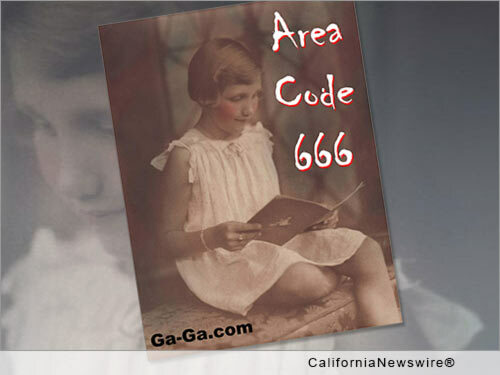 For more information, the Table of Contents for "Area Code 666" may be accessed at: http://johnscottg.com/area_CHAPTERS.htm – or start with chapter one directly, at (caution, mature content): http://ga-ga.com/fiction-area-code-666/. Note to editors: the fictional tales of "Area Code 666" do not promote devil worship, Satanism, or similar nonsense, but follow the classic tropes of good vs. evil, and the fact that evil doesn't always have visible horns.